The catalogue description of this Eason shot is "Mansion near Gorey, Co. Wexford" and there is a fine house with additional buildings to the rere. For Morning Mary the delightful aspect of it is the two young girls waiting at the front door area to welcome their loved ones home! Those massive brick chimneys are distinctive. It's not heritage, well. NIAH is coming up blank. [https://www.flickr.com/photos/[email protected]] Right enough - you can see it here in the megazoom. catalogue.nli.ie/Record/vtls000332270/Flickr Invernore House rather than Levuka House, according to the map. It's a campsite now. Per this blog entry: a house that was first known as Invermore when it was built in 1859. Invermore was designed by the Victorian architect Sir Thomas Newenham Deane as a house for M. Scott, the land agent of the Earls of Courtown. 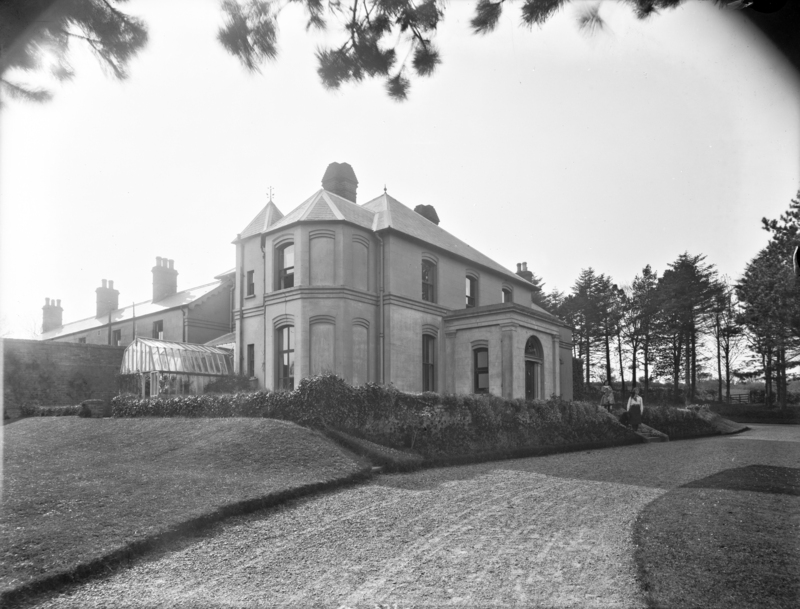 Later in the 19th century and in the early 20th century it had been home to the Hon George Stopford, brother of the Earl of Courtown, and Lady Mary Lloyd. ... It was known at different times as Levuka, the Oulart Hotel, the Sands Hotel and the Stopford House Hotel. According to newspaper reports, (sale of household goods in 1901 and 'a series of Tableaux and Private Theatricals' in 1872, it seems to have been associated with the Stopford family. In 1919, the sale is 'For the Hon, Geo F. W. Stopford' in 1872 the Stopfords mentioed are Lady Eleanor, Lady Grace, Lady Lily, although the host seems to have been a James S Scott. There was another sale of household goods there in 1944. The lengthy list of goods to be auctioned seems to include everything in the house which could be moved - beds, cookers, china, golf clubs, etc etc etc. he house was also known as Invermore. From comerfordfamily.blogspot.com/2009/09/comerford-profiles-2... which also has a picture of the overgrown pile of rubble which is all there is to see now. The house was built on a ridge overlooking Courtown Harbour. At times, it was also known as Levuka, and it changed hands and names many times. It became an hotel in 1947, and was known variously as the Oulart Hotel, the Sands Hotel and the Stopford House Hotel. Like most hotels in Courtown, it fell on hard times, was closed, and was recently demolished. All that I could see when I visited in January 2012 was a heap of rubble and a clump of trees in a fenced-off field near two small housing estates. Nothing is left of the stepped arches over the windows, the pyramid-shaped roof, the classical porch, the Gothic entrance arch, the elaborate fretted balusters on the main and secondary staircases with their plant and animal motifs, or the courtyard at the rear with its eclectic design executed in local red brick and the outbuildings with carved bargeboards, The once planned apartments were never built on the site, and the rubble of a grand old house that once looked down towards the harbour and out to sea – the rubble of a house that once played a minor role in Irish architectural and political history – shows no traces of a forgotten grandeur. George's brother, the Viscount up the road in Courtown House, had four daughters. This might be a young Cynthia (say 10 in 1910) with an older cousin like Edith (19), or perhaps the older one is Cynthia in say 1916, and the other girl her younger cousin Marina Marjorie. (Marina is clearly a transcription error from the form if you look at the pdf original). I think the second is a better fit - a gap of 5 years to Marjorie vs. 9 years to Edith. thepeerage lists Marina as Lady Marjorie Gertrude, lived to be 96. For completeness, I hunted down this house in the 1911 census in case some other family with photogenic daughters lived here, but it was unoccupied at the time of the census. You can see it here next to the RCC, it is #22 with 14 outhouses owned by the Earl.